Rupert Degas beautifully enlivens the characters that drive this complex story. The voices he creates are distinct. His female voices are the best I have heard a male produce. He maintains believable vocal tensions appropriate to the author’s paced reveals. I also appreciate that the author clearly develops the story without confusing time jumps that have become so popular. Really enjoyed this experience. I almost didn't get this title because of negative reviews about the reader. Look, if your expectations are similar to Jack Webb in Dragnet you will find McConnohie a ham! 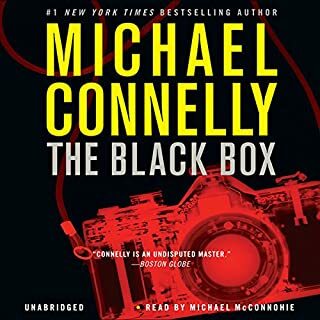 If you expect Len Cariou (my favorite Bosch), you will find the reader a little flat but not without expression and clarity. I'm glad I didn't miss this one. I enjoyed everything about listening to Glenister's reading of The Cuckoo's Calling. He taught me that sometimes my lukewarm response to a book is due to my lukewarm reading energy instead of any fault of the book. I read this in my Kindle without much enthusiasm when it was first published . Having taken advantage of a sale price to listen, I found myself delighted with all aspects of the plot and characters. As long as Glenister keeps reading this series, I'll keeping listening. 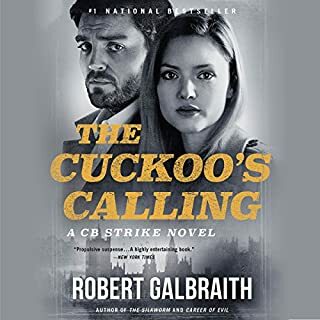 With his help I now really appreciate the wonderful story-telling talent of Galbraith/Rawlings. Wanting to prepare to read Joseph Anton, I found that Sam Dastor’s reading of Satanic Verses brought the book alive for me. Having bought the hardcover, in my little private feud with censors, the day Khomeini issued his death verdict for Rushdie, I have periodically attempted to read it but have never been able to “get into it”. Dastor changed all that as I listened and followed along with the print, enjoying the examination of differences in countries, religious tales, dream sequences, people in personal jealousies, divided cultural yearnings and loyalties, and mental confusion and illness--all with humor and literary references. Rushdie is a master of language and Dastor’s reading reflects his intelligence. I am now eager to hear Dastor read Rusdie’s memoir, Joseph Anton, about his life after Khomeini’s edict. 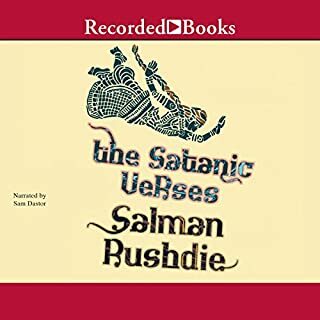 Since the heart of Satanic Verses is about the life of the “alien” or “exile” I expect a deep connection of its real message to Rushdie’s life. Note: There is a transposition of a section in the chapter “Ayesha” p. 214 -225 (starting in Part 2 of the download, Chapter 3 of 6 at 26:20 minutes) that the audible version moves to p.240, concluding the “Ayesha” section. I found it confusing, but it is part of the “serial visions” of Gibreel so if you feel a little confused without a text in front of you, don’t worry--it is all there and will be understandable in the end. 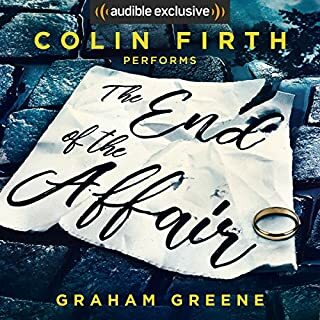 Colin Firth, with a voice I could listen to forever, reads with perfect nuance the struggles of Graham Greene's characters. Make no mistake, romance is not the subject of this novel about a British wartime affair. There is no dripping sentimentality about the end of the affair. These characters struggle with simultaneous hate and love of each other, as well as with their belief or non-belief in "God". All of the characters care; they are not indifferent to matters of religion. Even though I feel pretty "settled" in these affairs of mind and heart, I found much to think and care about here. Their Only Chance to be Beautiful? 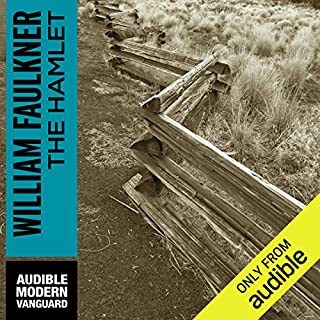 Faulkner's language is absolutely gorgeous, moving in wafts of sense-filled images through the reader/listener's mind and Joe Barrett's reading of it is perfection. I have read most of Faulkner's novels more than once (Absalom, Absalom, being my favorite). But times have changed and I was surprised by my patience being tried by the less-than-desirable characters. Getting older, I also find myself less patient with aspects of stories than seem contrived to shock; after decades of news, movies, and reading I find little actually shocking about "human" behavior so the attempts seem more artifice than art. So, I remind myself that Faulkner wrote in different times. In Richard Ford's novel, Canada, which I read about the same time as listening to The Hamlet, I was struck by an artist character who explained that she painted ugly, plain, decaying buildings because it was their only chance to be beautiful. I'm thinking this is a way to look at ugly, ignorant and cruel behavior told in beautiful language. So I am still considering spending 2 more credits to complete the Snopes trilogy read so beautifully by Joe Barrett. 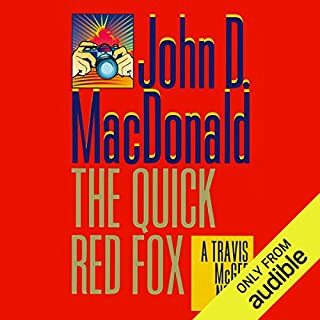 Listening to MacDonald's Quick Red Fox required some adjustment of sensibilities for this American woman listener. Having loved the "beautiful woman walks into the office" openings of Hammett's and Ross MacDonald's mysteries, I started out enjoying Travis Magee as ably read by Robert Petkoff. The mystery of a salacious-photo blackmail of a celebrity fit the expected genre subtype. I even appreciated the gentler language and the quick descriptions of violence in an older hardboiled mystery. My discomfort came with Travis's "my woman" attitude toward a love interest, his stereotypical flippant comparison of two lesbians to "authentic males," and the constant attention to female physical appearance without the equivalent descriptions of males. Even trying to set these aside, I can't say I find this novel meets the quality of other writers of about the same time in language, character or story. This was my first John D. MacDonald and I'm comparing to all of Ross M and Dashiel H, so I may be being a bit unfair! Two young friend, Max Glickman and Manny Washinski, get together in an abandoned air-raid shelter and create a comic-book history of Jewish suffering. Years later, Manny is in jail for a horrible crime and Max is a comic book artist. After Manny's release from prison decades later, the two meet again when Max is hired by a production company to write a film treatment based on Manny's life. In a Guardian interview, Howard Jacobson said this was his favorite of his novels. Its depth of character and ideas make his choice understandable. Jacobson's topic is serious and some of the details are horrifying, BUT much of this books is extremely funny, particularly in Tom Stechschulte's excellent reading of the author's witty way with words, ironic situations and ideas. As a British Jew, the author and his narrator "sound" a little different than the stereotypical American Yiddish humorist. His narrator, a Jewish cartoonist, remembers several time periods, his childhood with friends and family, his marriages, his adult life with friends and his memory of reading about the holocaust. Although the time periods are jumbled, they are easy to follow because of the literary devices of repetition of words and themes. For example, "Kalooki" is one of those repetitions; it is a card game similar to gin. The narrator at one point says that "not playing Kalooki is how I learned to understand I wasn't my mother." Other repetitions include his childhood "jew-jew-jew-jew" which his relatives thought was his attempt to imitate a train (choo-choo), which of course ties well to the story of Nazi transport of European Jews and the angst of his struggle with group identity. 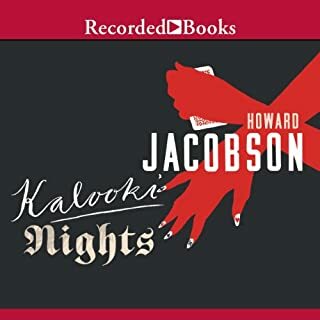 Early, Jacobson's narrator explains that his parents are in the "in-between" generation, between those who want to forget (those who experienced the holocaust) and those who know they must not forget (the narrator). He explores the ramifications of group identity brought by being a Jew whether religious or not. At one point he says that "To a Jew there is no acceptable way of being a Jew. Every other Jew has got it wrong." So he struggles to understand his own identification, his judgment of Jews and non-Jews, as well as their judgments of him. This book offers the opportunity to better understand individuals who struggle with being part of a group by birth. 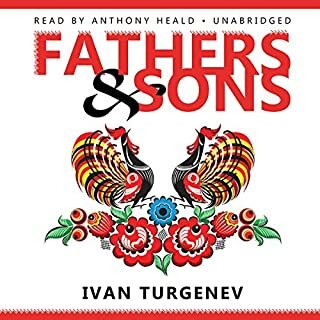 One of the most controversial Russian novels ever written, Fathers and Sons dramatizes the volcanic social conflicts that divided Russia just before the revolution, pitting peasants against masters, traditionalists against intellectuals, and fathers against sons. It is also a timeless depiction of the ongoing clash between generations. Anthony Heald's reading enhances this historically significant novel, clearly displaying age and attitude through his voice for each character. Basically this is the story of two young men visiting family and friends in Russia as social changes are upsetting the old serf-landowner system. The young men start out in a state of "causeless melancholy, known only to young people." They offend and hurt their elders who seem to admire or respect them even as the young men sneer at them for their old fashioned ways. The parents understand that "a son is a separate piece." As the story progresses, each of the young men is changed by experiencing romantic love--quite a challenge to fellows claiming to be nihilists, and each reacts differently. The characters, however, are extreme and the story is obviously geared to teach, a style which has pretty much gone out of fashion now. 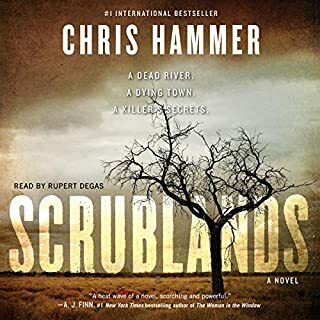 The author's narrator intrudes and speaks to the reader several times and summarizes the "current" life of each of the characters at the end of the book. 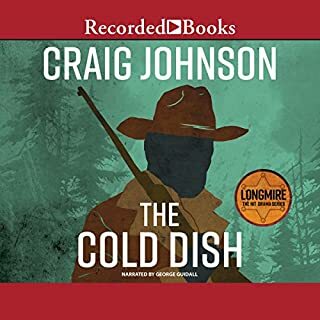 This book has been on my wish list since Guidall revealed that reading Craig Johnson was one of his favorite assignments. When the Longmire TV show was announced, I bought and listened to this book before watching the series. Guidall's voice is perfect for the novel whose main character is gruffer, scruffier and heavier than the TV version. It, also, appears that the TV series is doing a "cut and paste" job on plots; so, we can probably enjoy both, though, of course, the novel is richer in detail and development of character and relationships. In this first novel of the series, the grief of Longmire and his history with an unsatisfactory previous case provide a good means for showing us his character and his relationships with people in the community. I do like my heroes flawed and struggling so I will probably try more in this series.